Exotic Pets - Emperor Scorpion - as part of the series on pets and animals by GeoBeats. The Pulse Coral is one of the most sought after of the Xenia genus! They are either very easy or very difficult and no one knows why! One of my tanks killed them and another tank they flourished! The movement of the tentacles makes them appear to be "clapping" and in certain conditions can almost spread and become plague like! Many put them on equipment to help hide pump inlets, etc. Small additions of iodine are okay, but too much can melt them! While this video is supposed to be about a mysterious nudibranch, it just so happens to be hanging out on a pale green Tree Coral, Lemnalia sp.! These corals are ridiculously easy to care for, grow and propagate! A small frag can go into a nano tank and kept trimmed if desired! They do not seem to bother other corals if the tank is large enough. Personally, I have a small one in my 75 gallon with stony corals and they are fine. I also keep it under 6" tall! This video of a Waving Hand Coral has a great and useful narrative! These corals can be kept in nano tanks if they are kept cut back or are great in a large aquarium. Imagine the entire back wall covered with these! That would be mesmerizing! Low to moderate lighting is best and adding zooplankton is helpful for growth. If light is higher, acclimate them slowly and watch them for signs of stress. Unlike Xenia, they do not melt away. If you are fascinated by scorpions and enjoy keeping them as pets, you're not alone! The Scorpion has taken its place as a commanding pet, providing its keepers pleasure, curiosity, and fascination. As interests in keeping invertebrate species grows, more and more people are coming to enjoy the novilty and intrigue offered by pet scorpions. They are also hardy and easy to care for. Those factors, along with the excitement that they can evoke, will no doubt keep them popular with invertebrate keepers worldwide. Throughout history the scorpion instilled curiosity, intrigue, and often fear. The ancient Egyptians revered the scorpion as a symbol of power and death. The ancient philosopher and naturalist Aristotle commented on the scorpion in great detail. He described the uniqueness of its viviparity, the method in which they give birth to live offspring, and mentioned both lethal and non-lethal species. Modern myths and stories about scorpions abound. In some areas of Africa. There are indigenous Africans who feel that to touch a scorpion can change a man into a woman, or in some cases cause instant death. There are roughly 1500 recognized species of scorpions in the world. Although these living fossils are considered primitive, they show some amazingly advanced adaptations. The have an elaborate courtship behavior and a curious maternal intent in caring for their young. 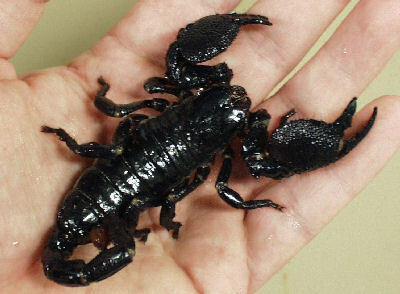 Most scorpions available as pets are not dangerous, though you need to handle them with care and respect. There are actually only 25 scorpions known to have venom capable of causing a human death. An estimated 1,000 people a year die from the stings of scorpions. There are many varieties of these fascinating creatures available in pet stores and from breeders. This is not surprising with the huge number of scorpions around the world. The list of arachnids below have guides for different types of scorpions. Each guide provides facts and information and how to keep them as pets. Caresheets includes habitat requirements, foods and feeding, tips for handling, and more.